Courtesy photo by Ray Bloxham, Southern Utah Wilderness Alliance The Muddy Creek proposed wilderness in Utah’s San Rafael Swell is among several BLM travel management areas where the feds agreed to re-evaluate 20,000 miles of routes it the BLM had approved across 6 million acres in southern Utah. The deal, which was upheld Wednesday by the 10th Circuit Court of Appeals, resolved eight years of litigation. Utah and several counties complained the agreement would force the BLM to retire routes if they degrade wilderness values. A federal appeals court has blocked Utah’s efforts to unravel the detente the Bureau of Land Management and motorized users reached with environmentalists over travel on thousands of miles of routes in southern Utah. 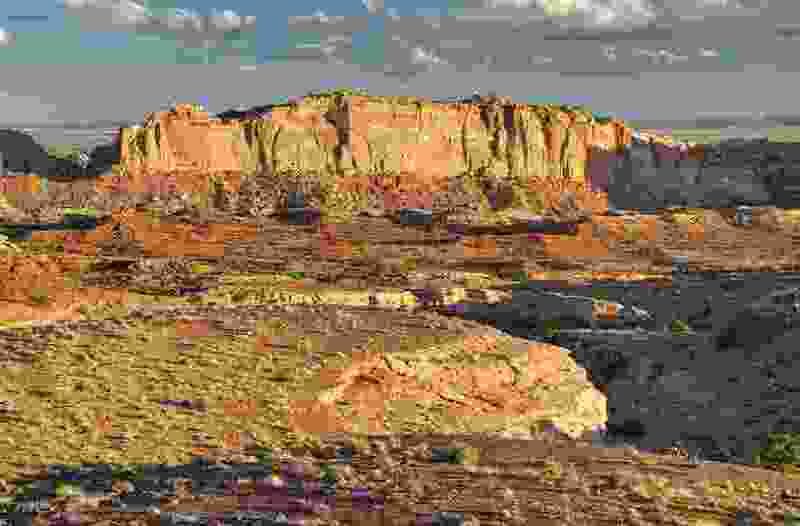 The Southern Utah Wilderness Alliance and nine other groups had negotiated a deal with the BLM last year requiring the land agency to revise resource-management plans after a lower court judge concluded the BLM failed to adequately document cultural resources that could be damaged by off-highway vehicles. The state, several counties and some energy companies argued the settlement illegally shackled the new Trump administration to guidelines protecting wilderness characteristics of public lands covered by the plans, which had authorized 20,000 miles of motorized routes across 6 million acres. The Denver-based 10th U.S. Circuit Court of Appeals disagreed and handed down a decision Wednesday affirming the hard-fought settlement approved by U.S. District Judge Dale Kimball, resolving eight years of litigation. Those criteria “increase exponentially burdens on the state,” Assistant Utah Attorney General David Halverson said in Sept. 25 oral arguments. He alleged the settlement enabled “certain special interests” to veto routes the counties may want included in the travel plans. At the hearing, Briscoe noted, the agreement states that it would not limit the BLM’s ability to implement new regulations and grants the agency broad discretion. “It’s not binding, it’s not limiting,” Briscoe said. “The parties may agree to modify the settlement. This is a very spongy settlement agreement. I’m not really certain what it really does because of this disclaimer." A spokeswoman for Utah Attorney General Sean Reyes said Thursday the office is reviewing the decision and considering its options. Environmentalists said the resource-management plans, covering lands overseen by the BLM’s Moab, Vernal, Price, Richfield, Kanab and Monticello field offices, locked in pro-drilling and pro-motorized-access policies as President George W. Bush was leaving office in 2008. The settlement deal sets an eight-year time frame for evaluating the routes while providing new criteria for deciding whether they should remain open to motorized use or modified to minimize impacts. “SUWA and its allies have already put hundreds of hours into field work for the first three [retooled] plans to be released in 2019 and 2020, located throughout the state and home to remarkable wilderness-caliber landscapes, including Labyrinth Canyon, the Henry Mountains, and public lands adjacent to Dinosaur National Monument,” said Stephen Bloch, SUWA’s legal director. As part of the settlement, the SUWA-led coalition also agreed to drop challenges to oil and gas leases sold in 2014, covering 70,000 acres, mostly in eastern Utah’s Uinta Basin. The federal government agreed to reimburse $400,000 of the groups' legal costs.